How some simple tweaks can turn your training from Mindless to Mindful, helping you get stronger, faster, and happier. Do you constantly find yourself stressed out about working out, or have nagging aches and pains? Often we don’t understand the real “Why’s” behind what we’re doing in training. Either someone just tells us to do it, and we do; we read it in a book (even worse) or we just make it up as we go along. The challenge is each of these ways often gets us into trouble, due to the lack of one key word, SUSTAINABILITY. Instead of developing a training plan, we let the training plan develop around us, one that is not sustainable for the long run. So here are some key no-no’s for training, and a mindful solution to each one. Increasing mileage or duration more than 10% a week. This one is common knowledge, though so few of us actually do it. The 10% rule helps keep us from overdoing it on a daily or weekly basis. For instance, it means you don’t run 30 minutes one day, and then 40 the next. That’s doing 33% more. Instead you may do 30 minutes one day, and then 33 minutes (a gain of 10%) 2 days later. This sounds like a really insubstantial gain, and mentally it is. But to your body, it’s a big difference. Exceeding 10% percent puts your body in the red zone, like over-revving an engine, and makes it hard to recover and keep from injury or nagging aches and pains. Be mindful about your workouts and look for slow and steady growth. The best way to avoid this is to log your minutes or log your miles. There are many great online sites and fantastic apps to help you track your progress, or you can kick it old school and just get a bound paper log. Be mindful, check your workouts in advance to know what you’re supposed to do, and then get the workout logged in as soon as you’re done. Note: Consider alternating workouts every-other-day. This gives your body time to rest and recover before going again. You don’t need be completely sedentary–just do another activity that gives those muscles a chance to rest and recover. This could be alternating running and cycling, or running and swimming, running and rowing, or even running and boxing. Just give the legs a chance to rest before working them again. Hopping up the intensity too quickly. Intensity’s a tricky one. There are a lot of trainers out there claiming the best workouts are the hardest. But they’re not…Unless you’re training to race. Even then, you’re putting yourself on the edge, making you more susceptible to injury and illness, building oxidative, inflammatory stress on the body, especially your heart. When you’re gasping for breath and pushing through the pain, you’ve put your body into an incredibly stressful situation. It’s now in the fight-or-flight zone, producing damaging quantities of stress hormones and inflammation, something you’ll have to deal with AFTER your workout. In addition, your muscles are tightening up under the stress, and you’re having to push through the tightness, tearing muscle AND connective tissue down, rather than building them stronger. Consider slowing down to stay with your breath. If you can talk while working out, then you’re likely experiencing a parasympathetic, or rest-and-relax response, which is much kinder and gentler on your body. As an added bonus, you’re also burning more fat! Now that doesn’t mean you have to go slow. You can actually build up to running at your maximum speed without gasping for breath. Of course, it’ll take some time to reach this level of mastery. It means for now, you’ll need to slow down a bit and let your breath be your guide. Also, consider trying nasal breathing. It’s harder in the beginning, but when you get slow, deep nasal breaths down, it keeps you from tightening up, producing harmful inflammation, and stressing out your body, mind and soul. It’s great to incorporate new kinds of movement into your training, but anytime you start something new, ease in slowly, but limiting both time and intensity. Starting too quickly with a new exercise, activity or class. It’s all too common. We get a gym membership, a new treadmill, an elliptical machine, or a new pair of shoes and we just want to go for it! That’s great, but we need to build in slowly. No matter how finely tuned you are, if you’re not used to the motion, than we have to start with a little bit. Step back and consider what the new activity, class, or equipment is you’ll be using or doing. How similar is it to what you’re already doing? Is there a new motion for the body? Ask yourself how much do you think your body can handle? Then do half that much to begin. Getting achy pains that just won’t go away. This is common when we do too much too fast or just go full throttle in all our workouts. Ask yourself, do you need a little time off or a lot? Chances are, you don’t want to take any time off. So here’s my recommendation, go to an every-other-days (and at lower intensity) schedule for a week or two and see how you feel. If you’re feeling better, then stick with this for a while. At least until you’re fully recovered. If not, consider taking a few days off, and preferably a week or two. Don’t panic, taking even two weeks off only reduces your fitness by 7%, and that’ll come back super-fast when you’re rested and recovered. Getting over nagging aches and pains now, prevents a long-term injury in the near future. Note: Nagging aches and pains are commonly form related too. When in doubt get a video analysis done, or have a coach you trust check out your form. If you’re dreading your upcoming run or workout, it’s a good idea to take a few moments to examine the root cause of your feelings. What you learn could save you from additional stress. You’re stressed out in anticipation of your workouts. This could be for two reasons. 1.) You intuitively know you’re doing too much, or going too hard, but you don’t know how to put on the brakes. 2.) You instinctively HATE what you’re doing. These both require journeying on the inside and listening to what your heart or intuition is trying to tell you. Perhaps it’s saying it loves long runs but not at full throttle. Or maybe it’s saying it’s bored as heck with the treadmill and would much rather take a hike or try that trendy new fitness class. Listen carefully, then TAKE ACTION. There’s nothing wrong with trying something new and mixing things up. In fact, one could argue the fittest people in the world are the ones who have the greatest diversity in their workouts. Just ease in slowly. Note: You could also be stressed out by pressure at home or work, and that’s spilling over into your workouts. That’s quite common. The answer isn’t to push through here, but respect the needs of your heart, and be kind and gentle with the workouts. Additionally, meditation can help greatly to help you let go of the pressure and let go of the tension. Working on mindfulness exercises to let go of thoughts and worries while you workout can help you TREMENDOUSLY here. 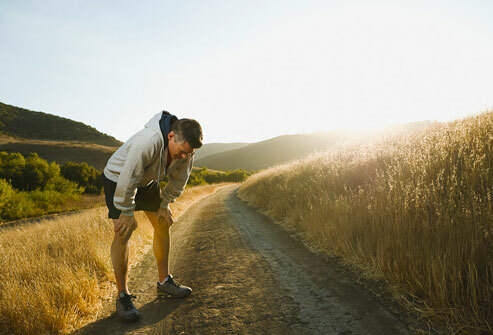 Regarding injuries and aches and pains…if you have increased distance or intensity too fast and the ache is bilateral (meaning equal in both legs) then take a few days off and see if it goes away. If the pain is unilateral (only in one leg) or if you haven’t increased distance or intensity recently, the cause of the pain is almost certainly caused by postural imbalance. Taking time off might make the pain go away, but it’s sure to come right back when you pick up the training again. Rest, ice, massage, foam rolling, anti-inflamatory medication, etc. do nothing about the cause of the pain but only hide it temporarily. This is a bad thing! Letting an imbalance fester means that it is slowly getting bigger and stronger and will come back with a vengeance eventually. Instead of ignoring the real cause of the pain, get inquisitive and go looking for the underlying imbalance and figure out how to fix it so you can prevent future pain and injury and get back to training immediately. And remember, as I always say: you weren’t just born to run, you were born to run pain free! You bring up another excellent point, masking the problem is never the answer. And rest alone will not cure a functional challenge. We must always look for a postural reason, for an imbalance in strength or flexibility, for poor form—form that does not work with the natural movement of the body, or for asymmetry in our form (really the same thing as the latter), and even for mechanical problems (man-made or otherwise). However, there are still great benefits to rest and doing recovery work, to allow inflammation to subside, to relieve tension, and working to remove knots or tight spots. This doesn’t mean we should ignore the root of the problem. Far from it, as doing so only invites even more challenges over the long run. That’s why we must work on balance, posture, symmetry, proper form, symmetrical strength, and so much more. Thanks for sharing, and yes, we were born to run pain free!